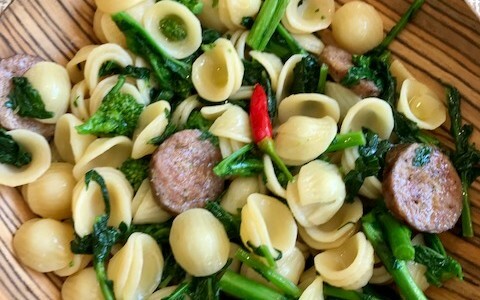 Home » Posts tagged "orecchiette pasta"
This pasta dish with rapini and sausage will comfort you all year round! Its main ingredient is rapini. Rapini are a green vegetable. The leaves, buds and stems are totally edible. Although the buds resemble broccoli, they do not form a large head. Rapini have a slightly bitter taste and we Italians use them in all sorts of recipes. However, this one is a big hit with all who sit around us at our dinner table! Note: Call your local specialty supermarket and ask them if they carry rapini. 1. In a 4-quart saucepot, heat 3 to 4 tablespoons olive oil. 2. When oil is hot, add the whole garlic cloves and stir-fry on medium high until they turn golden brown. 3. Immediately remove saucepot from hot burner; let cool for about 3 minutes. 4. After 3 minutes, add the rapini and cover the saucepot. 5. Cook the rapini on medium-high heat for 5 minutes, using tongs to stir them occasionally. 6. After 5 minutes, add salt to taste. Taste some rapini – they should be crunchy-tender. Set aside, covered. 1. In a 6-quart saucepot, heat the oil. 2. When oil is hot, add the sausage links – be careful to avoid splatters by covering the saucepot. 3. Sauce the sausage links on medium-high heat, covered, for 2 to 3 minutes. 4. After 2 to 3 minutes, carefully uncover the saucepot and, using a fork, poke holes in the sausage links. STAND AWAY FROM STOVE TO AVOID SPLATTERS. 5. Turn the sausage links over and cover on the other side for 3 to 4 minutes. 6. Repeat turning the sausage links over and cooking until they are 3/4 cooked. 7. When sausages are 3/4 cooked, lower heat. 8. Using shears and standing over skillet or saucepot, carefully cut the sausage links into 1-inch circles. 9. Cut circles in half and continue cooking sausage pieces for 1 minutes. 10. After 1 minute, stir in the rapini. Cover and set aside. 1. Bring a separate 6-quart saucepot of water to a boil. 2. Add the orecchiette pasta and salt; cook over medium-high heat for 8 to 10 minutes or until pasta is “al dente” (crunchy-tender). 3. Meanwhile, heat the sausage-rapini mixture through. 4. Drain the orecchiette pasta in a colander set over a sink. 5. Transfer the drained orecchiette pasta to the sausage-rapini mixture in saucepot; stir and heat through. 6. Taste the pasta mixture, adding more olive oil and salt, if desired. 7. Serve immediately in separate bowls, asking guests to add their own grated Parmigiano Reggiano or Pecorino Romano cheese and/or crushed red pepper.